All in all a disappointing day for the Tahs with 1.5/5 victories over Sydney. 1st grade had a tough day in the field and were set 365 for victory. Although at 2/231 off 31 overs victory seemed in sight thanks to an outstanding partnership between centurion Ollie Davies (100) and Jack Edwards (61) when both were removed in consecutive overs we never recovered. 2s tied an amazing match. At 3/227 with 8 overs to go Manly was cruising but then lost 6/21. Some final over craziness including three no-balls, a 6 from Hamish Starr, a two being called ‘one short’ and a final ball run out resulted in a tie that nonetheless saw Manly move into the top six. 3rd Grade also moved into the top six with a bonus point win courtesy of a brilliant 96 from Isaiah Vumbaca that resurrected the Manly innings that was wallowing at 5/38. All the bowlers did their job with Ryan Bishop-Perrett (3-8) the pick of them. Despite a lacklustre fielding performance and a middle order collapse of 5-12, 4th grade should have chased down Sydney’s 176. From 45 required off 42 balls with 2 wickets in hand to 11 required off the last 12 balls, Jordan Daly (56*) in his return from overseas and the tail fell three runs short. 5th Grade had a tough day at the office after lunch in every way. After two great half-centuries to Lachlan Charles and Josh Seward, skipper Dylan Marshall unfortunately fractured his wrist and the young side just weren’t able to put it together from there as Sydney chased Manly’s 200 none down. 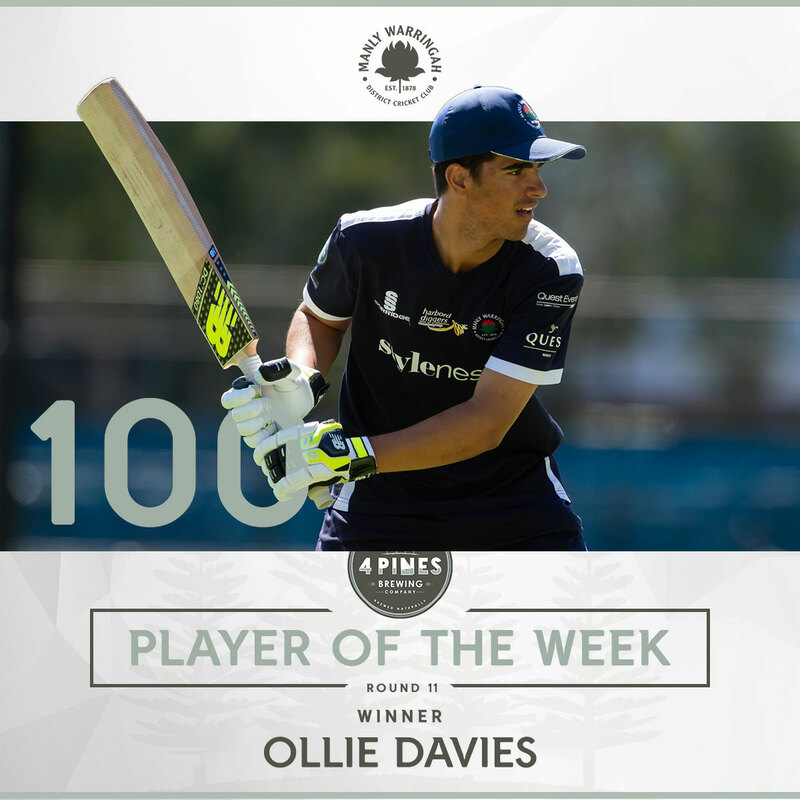 In a somewhat forgettable round, this weeks’ 4 Pines Player of the Week is Ollie Davies. Chasing a mammoth 365, he combined with Jack Edwards (61) for a partnership of 160 that brought victory within reach for the Tahs. Although the task eventually proved too large, the partnership kept the game in the balance and was as entertaining as any knock you’ll ever see in the big bash. Ollie smashed 100 (including nine sixes) off just 68 deliveries in an unforgettable display of power hitting. Keep up the great work mate! A strong First Grade Manly side turned up to Manly Oval on a Warm Sunny Australia Day. It was great to see the Edwards brothers back into the side after being with Sydney Sixes In the BBL and Ollie Davies back from Australia under 19’s duties. Manly elected to field first at a manly oval looking in really good condition. Mickey Edwards and Micheal Visser were the people to take the new ball and it was M Edwards to get the early breakthrough with a ball just coming back into the batsman off the pitch to hit the stumps. A very attacking start from Sydney sore them have the momentum at the start of the game which continued throughout their innings. Joe Graham came into the attack very early with his off spin bowling and it was Joey that dismissed the dangerous left handed opening batsman who was clearing the ropes numerous times. It was then a tough day for the manly boys In the field as the 4th wicket partnership for Sydney was ended after putting together a 215 run stand on a very good pitch for batting. Sydney’s innings finished on 5-365 which was a very good score and would be challenging to chase down. Manly had a great start to their innings from Ryan Farrell and Logan Weston with an opening stand of 60 which is what we needed for the incoming batsman to get started to chase down this large total. The 2 openers were dismissed in quick succession which brought Jack Edwards and Ollie Davies to the crease. It didn’t take Ollie many balls at all to start his innings by getting off the mark with a large six over cover, this was contained throughout his spectacular innings of 100 off just 68 balls with boundary’s all around the ground making it very hard for any bowler to bowl at him. He was well supported by Jack who made 61 which was also a very good innings to keep Manly in the game. The partnership was ended after a 160 run stand between them both then once these 2 had been dismissed the incoming batsman found it hard to continue the high ball striking standard the Ollie and Jack had set and Manly fall short by 57 runs. 2s turn up the beautiful Ryde oval, and the dressing rooms were 38 degrees before 9am…..where else would you want to be on a day where every one of your friends is at a beach with a beer or Canadian club in hand. As we get on the field we of course lost to toss and got sent out to field, but that’s okay because Max Webber aka magic mike would get the boys pumped to penetrate the deck and keep a tight ring. Hicks and Wilson open the bowling, and took 2 quick ones early. Besides one batsman looking the part, Gainsford introduced the main attraction, the man that makes the men cry and the women scream…MAX WEBBER! He comes in and bowls the only batsmen contributing to the scoreboard to have them 3-60. Tom Kaye, Sam Gainsford and Hamish Starr all bowled well with Tom Kaye in particular producing one of the best run outs I’ve ever seen, as well as a brilliant catch. All of the bowlers did a great job restricting the run rate with MAX WEBBER taking 3, Tom Kaye 2, Gainsford 1 and Wilson 3 to get them out for 265 on a field where 300 was on the cards. This was a massive achievement on a 30 plus degree day where we had a lot of extra work to get through in the field. We knew with MAX WEBBER and Ned hole the birthday boy we would start with a BANG! Ned and MAX WEBBER got off to a great start, after Max got out after 45, Tom Kaye joined Ned at the crease to steady the ship before Ned fell soon after we brought up the 100. Tom and Arshdeep Virdi got us back on track, until Tom fell to a good ball. Ashdeep and Brynn Mendel produced some clean hitting and got us right in the game before Ashdeep and Brynn were both out in quick succession and we lost a few wickets in clumps. It was up to Wilson and Starr at the end needing 18 off the last over, Hamish took the pressure right to the bowler, needing 2 runs off 2 balls Starr cleared the infield, we ran through for what we thought was the game winning runs but we were called one short by the umpire as Wilson apparently did not put his bat behind the crease. A tie to end the game, hard to swallow but I’m sure the guys will bounce back next game. Third grade arrived at Graham’s looking to make it four wins on the bounce against a Sydney side sitting just below us on the ladder. Manly were sent in to bat on what looked like a typical Graham’s wicket. Unfortunately some good bowling from their opener along with some 50/50 calls going against our batsmen had us in a disastrous position at 5-38 after 10. Luckily for the Waratahs, Vumbaca (96) looked in good touch and steadied the ship with skipper McLachlan (14). The pair managed to tough out a further 15 overs whilst adding a crucial 50 runs on to the score board until McLachlan was run out in suspicious looking circumstances. Vumbaca then took it upon himself to guide the Tahs to a defendable score, combining well with the tail. Hard running between the wickets and some quality boundary hitting from Izzy allowed Manly to reach 178 in the final over of the innings. Heading out into the field we knew we would have to start well with the ball to have a decent crack. Sommerville (0-22) did just that bowling some quality deliveries at good pace. He was unfortunate to have a caught behind turned down but his tight bowling allowed for Bishop-Perrett (3-8) to pick up both the openers at the other end. Alex Bain (2-12) started beautifully when he came on at first change. Bowling consistently at a difficult length for their batsmen to score from. The building pressure finally got to the batsmen where Bain managed to take 2 wickets in as many balls to give Manly a real sniff at a win. Counsell (3-22) was then introduced into the attack and showcased his skills, removing batsmen with some quality slower deliveries. Our right bowing really prevented Sydney from ever getting into the run chase and when Vumbaca (2-31) picked up two quick wickets we realised we where in with a chance of a bonus point win. Bishop-Perrett was re-introduced into the attack to take the final wicket and Sydney were dismissed for 98, allowing us to take home the bonus point. Australia Day started with such promise. Like Captain James Cook and his fleet of pasty Englishmen, Adam Gummer and his 4th Grade motley crew stepped onto uncharted lands, in this case it would be Goddard Park. After a shift due to the WBBL final at Drummoyne Oval the 4th grade battle with Sydney would take place on a flat, slow, turning deck with no gratuitous luxuries like sight-screens to get in the way. With a win of the toss and temperatures already nudging a streamy 30+, Captain Gummer made the call the send the Sydney natives into bat. Josh Wigney continued to be too quick for some underdone opening batsmen with the new rock. A first over badging of the young Sydney opener set the tone for a stellar opening spell. A wicket in his third over began the customary dismantling of opposing top orders that has become a staple for this classy fourth grade side. Wigs would finish with a very tidy 2-21 and was unlucky not to have a couple more. The sure and steady metronome that is Jimmy Crombie collected a couple of key scalps and Jake Osbourne soaked up the turning conditions with a brilliant 1-20 from his 10 overs. Unfortunately, rued chances in the field again robbed Osbourne of more scalps. Jacob ‘The Yak’ Graham stepped out of his knock-off Gucci slides to sweat out a few Bintang’s and grab 1-31 from a very solid 10 overs in the sticky climbing temps. At 5-60 odd, Gummers men were in complete control, but the potential to dismantle the tail and enjoy some early shade may have been their undoing. The Sydney lower order dug in, took advantage of some ‘luck’ (nee. poor fielding) and built the score to a tidy 176. But despite hot conditions, and the aforementioned lapses, this very proud 4th grade attack again took all 10 wickets as has become their modus operandi. Everyone happy to head to the sheds having only needed to bowl 45 overs. The competitive meetle and wiley left arm spin of Captain Gummer finished off the tail snaring 3-28. With an ‘on-paper’ batting line up to envy, the 4’s lads felt content that the 177 required would be chased down at a canter. With yet another solid launching pad set by Nick Cohen (18) and Skipper A. Gummer (36) there was no reason to think anything different. Unfortunately things began to unravel from there. An ascendant spell from the Sydney leg-spinner dismantled the Tahs middle-order. But it was still anyone’s game. Enter Manly’s quasi-Austrian recruit, the recently returned prodigal son, Jordan Daly. With the game in the balance who better than Daly to give Manly a sniff at victory. Needing 40 from the final 30 balls with 2 wickets in hand Daly almost guided the Manly boys home, but the 4 required off the last two balls proved too steep a mountain for number 10, A. Rochford, to climb. The second heart-breaking close loss for the Manly lads in the last 3 rounds. Nestled in second place on the ladder at the beginning of the round, this loss will again see them slide with finals on the horizon. But one thing is for sure, this Manly 4th Grade side are a group fully aware of the missteps that occurred and the improvements needed to turn that L into and W. Look out next week Gordon, this 4th Grade side is done with gifting lesser sides a victory. The 5s boys rocked up to the infamous Mike Pawley oval, confident coming off the back of a few well fought wins. Once skipper Marshall won the toss with a flip of the coin, the Manly boys elected to bat on an even deck. The day started off on a positive note, with Seward and Barnett easily dismissing the opening bowlers, respecting the good ball, ticking over the strike to post a 35 run partnership until Barnett was dismissed on 13. The entrance of Lachie Charles to the crease, accompanied by Seward, really began to take a toll on the frustrated opposition, both of them rarely playing a false stroke, always waiting for the bad ball. However, Sydney got back in to the game with the wickets of Charles (51), Jones and Seward (62), bringing the total to 4-161. An entertaining cameo from Duly (19), Melville (13) and Dunlop (10) accelerated the total, setting up the boys for a total well over 200. However, the loss of a few quick wickets ended the 5s boys innings on 200, a easily defendable score, but the boys were disappointed they didn’t go on to make a few more. Coming out onto the field, Sydney had the momentum from last innings, snagging a few quick poles. Yet, the boys came out onto the field focused, and raring to go. There were a few tough chances early on from the first few bowlers, but unfortunately nothing was sticking in the hands. The bowlers bowled consistent line and lengths but credit to the Sydney batters who always punished the bad ball. Unfortunately, the boys couldn’t come away with a win, it was just one of those days where all the luck was on Sydney’s side. The bowlers toiled extremely hard on deck, but the Sydney batters were all over Manly’s line and length, picking the variations from each bowler. Overall, an experience no player wants to go through but was crucial for the young players to see a high standard that is set for them. Manly U18 Brewer girls were playing a tough game today against the top of the table and undefeated Northern Districts Blue in a morning T20. It was going to be a hot day but Grahams was looking good. Manly won the toss and elected to bowl. Chelsea opened the bowling from the city end and gave us a strong start by getting an LBW off the 3rd ball of the game, dismissing the opener for a duck. Laura opened from the other end and her and Chelsea continued their tight bowling for the next 2 overs. Then Chloe came on to bowl and got an LBW the first ball of her spell. She then continued her good form taking another wicket later in the over with a bowled that clipped the top of off stump. Her and Abbey Melville bowled the next 4 overs and kept the runs to a minimum, with Abbey unlucky not to get a wicket. The next breakthrough came from Gemma in the 8th over. Her first ball was short but the pitch had no bounce in it so it stayed really low and she got an LBW. She continued her spell with a bowled wicket and ended her over on a double wicket maiden. Sienna came into bowl and off her first ball got a nick which went to Mia Nel who was positioned at 2nd slip who took a one-handed diving screamer dismissing the opener who was batting in top form, which was a breakthrough we needed. Sienna and Gem bowled their 2nd overs with 1 run going off each of them. Kate Salmon bowled next and on the 3rd ball Laura took a great catch at square leg. Kate finished her over as a wicket maiden. Mia Waddington then came in and bowled a maiden. Her and Kate off their next overs only let 3 runs go between then with Kate getting a bowled wicket. Jess took an amazing caught and bowled in the next over, with the ball getting hit hard, fast and low straight back to her. Mia Nel bowled the 17th over and was extremely unlucky not to get a wicket. The innings was finished off with a run out by Gemma and assisted by Jess at the bowler’s end. Northern Districts were all out for 44 off 18 overs which was a brilliant achievement for the girls. The bowling was superb, and the wicket helped with the ball keeping very low. The fielding and bowling were very tight and one of our best performances with the ball all season. With the ball keeping low and only a small total to chase Nat and Mia Nel were sent into open with the instructions to play forward and build a strong platform, not worrying about the runs to start with. Unfortunately, Mia was run out from a hesitated call for a diamond duck off the first over. Not the start we were looking for. Next in was Jess Mulcahy. Together the girls played safely off strong bowling, keeping the runs slowly ticking over for a few overs until Jess was bowled for 6. Sienna came in and preformed an amazing cameo. She hit a quick 16 off 16 with 2 fours and some quick running. This was exactly what we needed and boosted our run rate. She was then caught at square leg, unlucky for her but it was a great catch. Kate came in but unfortunately got a first ball LBW bringing Mia Waddington to the crease. Her and Nat put on some quick runs to get the total to 41. Then there was a mix up with the score board, as the girls on the pitch including the umpires thought that we had got the runs, as it looked like a 7, so thinking this Mia went for a slog sweep and got out LBW bringing Gemma in. Everyone still thought we had won so Nat went for a drive but mistimed it hitting up above mid-wicket’s head and getting caught. After that we figured out we were on 41 not 47 and still had 4 runs to get. Chloe came in and Gemma was on strike but got bowled which brought Laura in. These 2 took some quick runs to finish off the runs and from there we batted on. In the last over Chloe got run out after trying to take a quick single. Ruby came in and together with Laura they finished off the innings and brought our total to 8/56. This was a good batting innings taking to account the situation and was a good win by the girls, defeating the top team with ease.